The human brain is constantly processing sensory information through the eyes, ears, nose, tongue, and skin. Our senses make our world come alive. But for children with Sensory Processing Disorder (SPD), sensory signals sometimes aren’t interpreted and organized correctly. According to a 2004 study by psychologist and DRT/Floortime specialist Dr. Rioanne Ahn, around 1 in 20 children have SPD, which can present in as many different ways as there are diagnosed children. For some, clothing, physical contact, light, sound, food, or other sensory input is unbearably intense and unpleasant. Others may have the opposite reaction and show little or no response to sensory signals; even pain or extreme temperatures might go unrecognized. In order to help parents and caregivers better appreciate the world of children with SPD – and to help them to better communicate with one another – several books for children of all ages offer insights into their unique sensory needs. I’ll tell you why I can’t wear those clothes! : Talking about tactile defensiveness by Noreen O’Sullivan is written from a child’s perspective on tactile defensiveness, a physical condition that causes hypersensitivity to certain touch sensations. 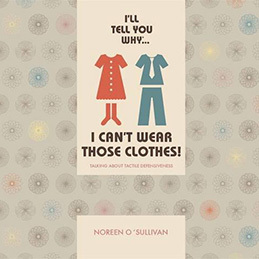 Intended for parents to read with their children, the book explains why a child may become emotionally overwhelmed by daily routines such as putting on clothing, socks and shoes. Children with Tactile Defensiveness often have difficulty describing the reasons they feel upset by sensory issues and O’Sullivan’s book shows them how to express their emotions in drawing, writing or by talking. Why Does Izzy Cover Her Ears? 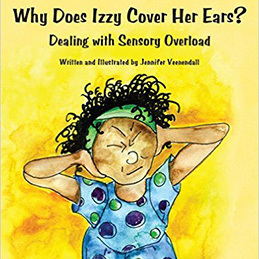 Dealing with Sensory Overload by Jennifer Veenendall tells the story of first grader Izzy coping in new surroundings and the ensuing sensory overload. Her own response to overstimulation is to cover her ears, lash out, or cry, causing her classmates to label her as mean and a crybaby. But with help of her parents, teachers, and her occupational therapist, she learns how to cope and make friends. Resources for parents, including suggested discussion questions and a list of related books and websites, are included. 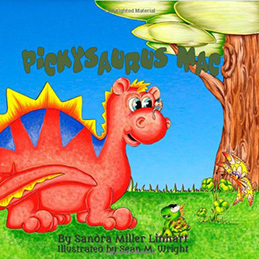 Pickysaurus Mac by Sandra Miller Linhart focuses on a dinosaur named Pickysaurus Mac, who has a difficult time with food. Called a “pickey eater”, he tells people that sometimes his food smells gross, tastes different than it looks, and has a texture that feels icky in his mouth. This clever book encourages children to experience new textures in a safe, unforced environment that increases sensory tolerance and lets them know that other kids share the same discomfort with food. 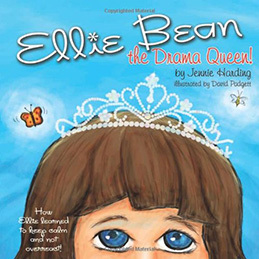 Ellie Bean the Drama Queen: A Children’s Book about Sensory Processing Disorder by Jennie Harding explores what young children with sensory disorders might expect when working with an occupational therapist. Others called Ellie Bean a “drama queen” when only Ellie knew the reason why she cried for so long was that the tag on her shirt felt like it was digging into her back. Only Ellie knew that the reason why she hated brushing her teeth was that the bristles on the toothbrush felt like they were scratching her teeth. Children with sensory disorders learn how to label their negative experiences and why they feel overwhelmed and anxious. 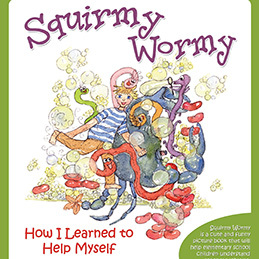 Squirmy Wormy: How I Learned to Help Myself by Lynda Farrington Wilson, about Tyler and the easy therapies he does every day to make himself feel better about his SPD, was voted 2012 Book of the Year by Creative Child Magazine. Tyler, the author’s real-life son, learns and shares how he deal with his sensory issues. Sometimes he likes to run really fast – run, run, run – or squishes down between the couch cushions like a hot dog for a hug that makes him feel calm. 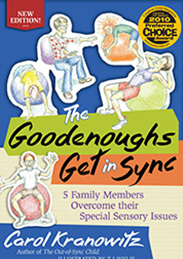 The Goodenoughs Get in Sync: 5 Family Members Overcome their Special Sensory Issues by Carol Kranowitz follows one family with five different sensory issues as they come together after a difficult day and learn how to cope as a family. Darwin is over-responsive to sensory stimulation while Edward is under-responsive. Teen-aged Carrie has difficulties with dyspraxia. The father has sensory discrimination issues and the mother is a sensory seeker. Together, they navigate their difficulties and learn to relate to each other. A list of equipment and activities for a sensory diet is included in the appendices, as well as guidance on the pronunciation of difficult words and their definitions. The Goodenoughs Get in Sync was the winner of an i-Parenting Media Award and a Finalist for ForeWord Magazine’s 2005 Book of the Year for juvenile non-fiction. 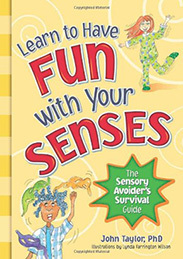 Learn to Have Fun with Your Senses: The Sensory Avoider’s Survival Guide by John Taylor is an introduction to the senses that allows children to read about and understand what is going on inside their own brains and how to cope with their sensory difficulties. 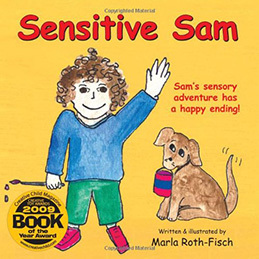 A variety of checklists, self-evaluations, and suggested activities is included in the book to help children overcome sensory challenges by keeping track of their own responses. Readers are encouraged to use their senses instead of avoiding them because of fear or discomfort. 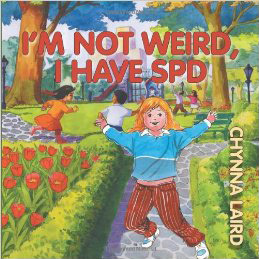 I’m Not Weird, I Have Sensory Processing Disorder (SPD): Alexandra’s Journey (2nd Edition) (Growing with Love) by Chynna T. Laird was written for the author’s daughter, Jaimie, who has SPD. Laird originally wrote it to show Jaimie that other children feel things the way she does and to help her daughter explain SPD to her classmates. I’m Not Weird, I Have Sensory Processing Disorder tells the story of Alexandra, who has difficulties with noise, smells, light, texture, and food. Sometimes it all becomes too much and she screams to block out what is bothering her, spins around in a circle, and squeezes herself into tight places. An occupational therapist talks to her parents and helps the family learn to cope with SPD and gives them the insight and knowledge they need to understand what the world is like from Alexandra’s point of view. At the end of the book, there are some sense-based activities that show the different ways SPD presents itself. 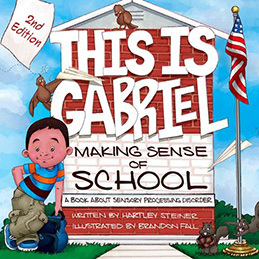 This is Gabriel: Making Sense of School – 2nd Edition: A Book about Sensory Processing Disorder by Hartley Steiner shows the challenges her son Gabriel faces in the classroom because of his SPD and provides effective ways he can overcome them and meet his sensory needs. Slightly different from the first edition, this version of the book is told by Gabriel himself to help the reader connect with him on a more personal level. Each page begins with a description of one of the senses and goes on to tell the reader both what Gabriel must do to cope with his SPD and what others can do to help. School is a difficult place for children with SPD and Gabriel’s tips and strategies to create a calmer environment are extremely helpful. Images © by copyright holders. All rights reserved.